Any minute now, our own web-savvy Rand Hoppe will be adding a PDF preview of our upcoming COMICS 101 giveaway to its description page on our website. We just show a couple of pages from each section, to give you an idea of what it’s like. So, how did Roy Thomas boil down 30+ years of comics history into 3000 words or less? Or how about Michael Eury doing the same for the history of comics from 1970 to today?! 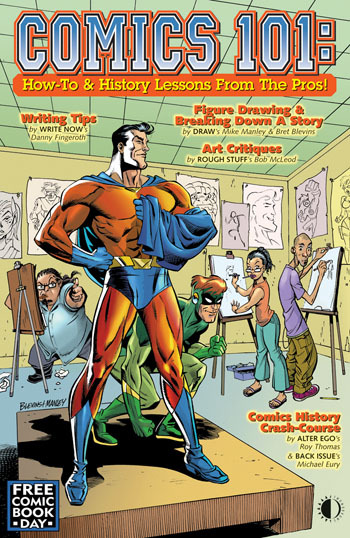 What figure drawing wisdom will Bret Blevins impart to readers, and can Mike Manley really show you how to break down a comics page in three easy steps?!! Plus, just what are Danny Fingeroth’s Top Ten Tips for Comics Writers?!?! These questions and more will be answered, but only if you canoodle your local comics shop owner into ordering COMICS 101 when it hits the Previews catalog at the beginning of March. It’s for all ages, so it’s a perfect way to introduce young kids to how comics are created, and to teach them the basic history of the medium. But it’s also just a really neat collectible for us old geezers who already love the TwoMorrows mags. Our pals at Wizard are offering a sampler reprint compilation of one of their “how to draw like (insert flavor of the month here)” pubs, so if your retailer isn’t familiar with TwoMorrows already, they’d likely opt for the Wizard book (cause like it or not, all the retailers know Wizard). If you want to see the whole thing, be sure to stop by our booth at the New York Comicon next week (#975), or at Wondercon the following week (booth #913). Or go see Michael Eury in Artists’ Alley at the Emerald City Con at the end of March. We’ve got a complete preview copy of Comics 101 we’d love to show you! This entry was posted in TNT on 16 February 2007 by Mr. Morrow.